A record number of attendees turned out to honor four outstanding Colorado judges at the Colorado Judicial Institute’s (CJI’s) Ninth Annual Judicial Excellence for Colorado Dinner at the Denver Marriott City Center Hotel on November 1. District Judge O. John Kuenhold from southern Colorado, District Court Presiding Judge C. Jean Stewart from the Denver Probate Court, Judge Christine Carney from Larimer County and Magistrate Stephanie Rubinstein from Mesa County were the honored jurists. With over 680 tickets sold and despite a looming blizzard, the 2011 dinner was the largest yet for CJI. Representing the Colorado Supreme Court were Chief Justice Michael Bender and recently named Manager of Safety for Denver, former Justice Alex J. Martinez. Out in force were 14 judges from the Colorado Court of Appeals, joined by more than 80 current or retired judges and/or magistrates, and 11 former Judicial Excellence for Colorado Award recipients. The CJI dinner also attracted a record number of sponsors. For the sixth consecutive year, Wheeler Trigg O’Donnell LLP was CJI’s platinum sponsor; COPIC Companies and DISH Network L.L.C. 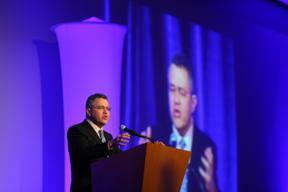 co-sponsored keynote speaker Jeffrey Toobin; and Perkins Coie LLP hosted an “invitation-only” speaker’s reception. Many of the 2011 Gold Sponsors have been loyal supporters of this event since its inception in 2003. Quickly changing roles from the journalist reporting in front of CNN cameras to that of CJI’s keynote speaker, Jeffrey Toobin praised Colorado’s merit selection and non-partisan retention election system, saying, “You have an unusual judicial selection in Colorado. It’s one you should be very proud of. Former Supreme Court Justice Sandra Day O’Connor has spent much of her retirement working to spare the country from the excesses of [contested partisan] judicial elections. Colorado deserves to be a model for the Supreme Court.” Toobin, CNN legal analyst, writer for The New Yorker and acclaimed author of the best-selling book, “The Nine,” frequently injected humor into an otherwise serious discussion of the history of the Supreme Court. In addition to recognizing judicial excellence, the annual dinner raises funds to foster excellence through education. Since the creation of the CJI Judicial Education Fund in 2002, more than $200,000 has been awarded to support continuing education for judges, magistrates and full-time judicial department employees. Such grants have become even more crucial in recent years, as cutbacks in the court system’s state budget have eliminated many judicial education opportunities.